British Drug and Alcohol Policy: III. What is Minimum Pricing of Alcohol and Will it Reduce Problem Drinking? Although it is often asserted that â€œalcoholics will do anything to get their drinkâ€, there is overwhelming evidence that even the heaviest drinking segment of the population responds to increases in price (A scholarly and readable summary of the scientific literature in this area was recently produced by the estimable Phil Cook). People who are physically dependent on alcohol show less elasticity in their demand than the rest of the population, but still nonetheless drink less than they would otherwise when alcohol is more expensive. The converse is also true, as the U.K. experience shows: Very cheap booze will produce a rise in excessive drinking. Many UK supermarkets sell alcoholic beverages below cost as a loss leader, and licensed outlets often sell very cheap drinks during promotions, e.g., happy hour or ladies’ night (â€œIt takes some seed to attract a flock of birdsâ€ as a landlord on the Strand explained it to me). Many U.S. public health advocates therefore consider raising alcohol excise taxes the best way to reduce problem drinking and the health and social damage it does. In a number of the Commonwealth Countries, including the U.K., an alternative approach known as minimum pricing is gaining traction. Minimum pricing is based on a system of standardized â€œunitsâ€ of pure ethanol (in the UK itâ€™s 10ml or 8g) such that larger volumes of low alcohol content beverages are equal to small volumes of high alcohol content beverages (i.e., a third of a pint of 5-6% beer = half a glass of 12% wine = one measure of 40% whisky). Because heavy drinkers pay far less (about 80% less, according to research by Bill Kerr and Tom Greenfield of the Alcohol Research Group) per unit of alcohol consumed than does the rest of the population, setting a minimum price is intended to concentrate the consumption-reducing effects of increased price on that subset of the population whose alcohol use poses the greatest risk to themselves and others. Minimum pricing also has a characteristic that makes it more politically palatable: It’s not a tax. The merchants keep all the money from the sale of minimum priced alcohol, and hence are less resistant than they would be to taxes that went to the government (Case in point: Tesco has endorsed minimum pricing ). You might wonder why the U.K. government is considering minimum pricing instead of taking the simpler step of banning below-cost sales of alcohol. A number of politicians have proposed this, but it is probably not feasible. It is very hard for regulators to determine the true cost of production, and, under EU trade harmonization policies, it is not clear that banning below costs sales is legal (As I described in an earlier post, EU harmonization is tending to make legal alcohol more available and legal cannabis less available in member states). News reports claim that Saskatchewan has cut binge drinking by implementing minimum pricing, although a rigorous study by a disinterested researcher is apparently lacking (I am given to understand that Tim Stockwell, a well-respected alcohol researcher in British Columbia, is on the case, so I hope for better data in the future). A minimum pricing law missed passing the Scottish parliament by a single vote this June. My motherâ€™s family is Scottish (MacNabb tartan at left) and I enjoy the country and the people very much, so I hope I will be forgiven for indulging a bit in stereotype by saying that it takes some courage for politicians to vote to deny the Scottish people a discount. Nonetheless the idea still has legs in Scotland and may come up for a vote again soon. Simon Moore of Cardiff University believes that minimum pricingâ€™s possible benefits have been oversold. He and I and some other researchers debate this point in the current issue of Alcohol and Alcoholism. His particular worry that minimum pricing will cause heavy drinkers to switch to other substances, e.g., benzodiazepines, I think will apply only for a small number of very troubled drinkers and not the population of alcohol-consuming population as whole (We have bet a minimum-priced pint on this). A second complaint about minimum pricing is that overall alcohol consumption is already falling in the UK, so there is no real problem for the government to solve. Alcohol consumption is highly skewed though, so total population consumption can drop while problem drinking soars which is what seems to be happening now in the UK. The third common objection to minimum pricing is that the culture can handle this without government help. Italy for example, has experienced a significant drop in alcohol consumption over recent decades with no effective government intervention (I mean that in an absolute sense, not just compared to the general level of effectiveness we associate with Italian government). Wonâ€™t Britons get sick of all the heavy drinking and start to cut back and help their friends and family members cut back through normal cultural evolution? When he was in the Thatcher government, he was at one point given responsibility for Roads and Traffic. As he expected (correctly) that he would move on to another post in 2 or 3 years, he assembled his senior staff and asked what he could do as Minister to make a major difference in that short window of time. He raised the issue of responding to drink driving fatalities, and was told by the knowledgeable people around him that he was on a hiding to nothing: Government policy was not going to reduce such a massive problem so quickly. He therefore launched no policy initiatives in that area. Yet drink driving fatalities declined dramatically under his watch. He said that what happened was that the culture changed. People started disapproving of drink driving, designated drivers became more the fashion, party hosts were more careful about serving â€œone for the roadâ€ and so forth. New government interventions, as Peter saw it anyway, were not necessary because the culture had the power to self-correct on its own. This story stayed with me and still does. There is no doubt that the phenomenon he describes is real and sometimes policymakers intervene when they are not needed. But I am not persuaded that this is the right view to take of cultural tolerance for excessive drinking in the UK, because on this particular issue civil society is not a “natural, independent, self-healing organismâ€ which government should regard as sacred. Rather, it is being actively pushed in a specific direction by economic interests. The culture needs a push from from the other side (i.e., public policy) in order to bring its natural self-correcting powers to bear. I donâ€™t of course know whether minimum pricing, coupled with some of the other improved alcohol control policies being bruited by the Home Office will be precisely the right push, but I am quite convinced that the alcohol problem in the U.K. is at a point where a carefully evaluated introduction of new alcohol policies is essential for the health and safety of the citizenry. I am sorry this was such a long post. I would have made it shorter but I didnâ€™t have enough time. Next up in this series: The controversy over methadone in the U.K.
"London traffic was shockingly light." Congestion pricing at work? Another example of the effectivenes of the price mechanism – brought in here by maverick lefty Mayor Ken Livingstone. Hmmm. The Scottish law proposed a price of around $.69 per unit of alcohol (GBP .45). Presumably the minimum price would almost never be binding for drinks bought individually (ie, at a bar — a pint probably already costs more than $2.07), and so would only come into play at liquor stores. No real point here, I just figured I'd add a bit of context to what that price means. Let's look at BevMo's current prices compared to the proposed minimum — BevMo is a US national chain which sells liquor at about the lowest prices you'll see, a corner store in a city might charge twice as much. The proposed minimum for a 750ml bottle of liquor (a fifth) at 40% alcohol would have a minimum price of $20.70. BevMo's prices for national brands of vodka: Svedka is $12.99, Smirnoff is $13.99, Skyy is $16.99, Stolichnaya is $19.99, Absolut is $20.99, Ketel One is $21.99, Grey Goose is $25.98, Belvedere is $29.99. If you want a better value at BevMo, you'd buy a "handle" — 1.75 liters, proposed minimum price of $40.80. Popov (what you'd mix into punch at a frat party) is $12.99, Smirnoff is $16.98, Ketel One is $32.98, Belvedere is $42, and Grey Goose is $52. Alex — thank you, excellent job of putting meat on the bones with concrete examples. In terms of pint cost in the UK, there are 2 for 1 sales, all you can drink for one price nights, ladies' nights, happy hours, one pound lager on football day specials etc where the price goes lower than the Scottish proposed minimum price. But in general your reasoning applies: Most pubs and pub customers have little to fear from minimum pricing because they are already used to paying more than that outside of promotions (and an end to promotions would make a certain type of pub go-er happy, I have a friend who wanted his pub to adopt "grumpy hour" in which every pint costs double, driving away the bingers and leaving him to nurse his pint in peace). I’d like to say a word about the power of shifting cultural attitudes – at least in the US. When I was a drunk, the most glamorous people I hung out with were drunks too, especially those bragging about how much booze they took on. “Oh, man, did I get plastered last night,” etc. When I went into rehab, it was my first time ever in a society where the most admired members were not those who drank the most but those whom the general population felt most likely to stay sober after rehab was over. “I think Janice will make it, but I feel sorry for Eddie– not a clue.” No one had to lecture me. I introjected the idea and haven’t had a drink since. Crikey, Keith. Our alcohol problem is worse than I thought… The British Red Cross is heading into schools to teach 11-year olds first aid for when their friends get dangerously drunk….! Has the world gone mad? Oversold, maybe, although I would say more concerned that limited evidence is being used to inform policies that offer more than they can deliver. The article in Alcohol and Alcoholism Keith mentions was written after a conversation with a substance misuse worker whose client base were young offenders, the kids who really do hang around street corners causing problems. I was curious to know what she thought would happen if the price of alcohol went up. Her response was that most of her clients aren't bothered so long as they are "off their heads" on something. I thought this was interesting, so took a look at the literature and found little. With particular reference to Keith's discussion, there is an overriding assumption that the demand for goods is sensitive to price. Addiction to one side, this is fallacious and a better approach would be to state goods are sensitive to price all else being equal – and in that "all else" we must stick wealth, certainly if we are going down the utility maximising rational agent approach some economists still cling to. In the UK the price of alcohol has decreased, but at the same time wealth has increased, so greater disposable incomes, more money to spend on alcohol. Another issue – if we apply this rational model strictly, then surely those with limited resources are those that would be expected to drink least. In fact, we find low socio-economic status is associated with greater consumption. Until, that is, you start to look at the data as emerging from two distinct processes, then we find that there is the decision to drink and then how much to drink. Wealth plays differently on these two decisions (we've completed the analyses but have yet to write the paper, so I will not say more). So we have a model of price that doesn't fit the data, is generally poorly implemented, a very limited empirical research base, not to mention the very serious issues concerning inferences on individual behaviour from models of aggregate data (too many studies in this area fail at this point), and we end up with not a lot to go on. Now go back to those vulnerable youngsters – we interviewed a few of them as a pilot to a larger study what they would do if the price of alcohol went up. "Rob more", was one response. The UK Medical Research Council advise that complex interventions should consider a broad range of outcome measures. Sure, we can put the price of alcohol up and perhaps see some health problems decline in the medium term, but in an age when youngsters can purchase "legal highs" on the internet, the most vulnerable steal to fund consumption, at the very least we need to consider a range of outcomes that extend to violence, crime generally as well as the use of illicit substances. My guess is that it is not the price of alcohol that matters, but the relative price of alcohol. Some of the vulnerable youngsters I have met say they would like to go swimming, use the gym, learn to rap, and so on, but that they cannot afford to. Drinking cheap alcohol on the street is all that is left for many. And so, swimming against the herd, my prediction is that if we do consider the effect of alcohol price on a broad range of outcomes then we'll see an increase in overall harm. I think there are better, more sophisticated, ways to crack this nut but that more than anything we need to address this peculiar idea many youngsters seem to have that fun is directly proportional to the volume of alcohol consumed. I believe there are minimum prices in at least some states for other things including milk (to protect dairy farm income) and tobacco (Ribisl has a squib in Morbidity and Mortality Weekly Report on them, http://www.cdc.gov/mmwr/preview/mmwrhtml/mm5913a2…. So the idea isn't entirely foreign and apparently can overcome practical barriers to implementation. That there is an "income elasticity of demand" (meaning people with more disposable income may consume more — or, for certain items called "inferior goods" less — than others) in no way contradicts the idea that there is also a "price elasticity of demand" (the elasticity meant most often by the term). Likewise it is customary to distinguish between a "participation elasticity with respect to price" (how price change affects prevalence) and a "conditional price elasticity of demand" (meaning how price affects intensity of use by those who continue to use). And economists do understand that estimates of elasticity — or most any other parameter — pertain "all else being equal"; that's why 'ceteris paribus' comes up so often in their writings. Last — that living things will respond to an incentive, such as changed price, in no way requires utility maximization. Plants respond by growing toward light without thinking about it much. So consumers' buying less when prices go up is perfectly consistent with satisficing and a host of other heuristic approaches to decision making that many find more psychologically plausible than strict utility maximization. So I'm not sure any of the previous post is really inconsistent with the idea that price increases, including those stemming from taxes, will tend to restrain consumption (ceteris paribus of course). A most interesting exchange. I would add that virtually all Canadian jurisdictions have some form of minimum pricing, however Saskatchewan stands out since it recently increased minimum prices to a level that might actually make a difference – round about CAN$1.80 per Canadian standard drink (=17.2 mL ethanol). Preliminary reports since April 1 suggest declines in public disorder – but that awaits a more careful investigation to confirm. One other comment – it intrigues me how influential the current trend in consumption seems to be from an alcohol policy perspective: so per capita consumption may be down a few percent, does that need to take the steam out of concerns about the many thousand preventable deaths and injuries? I agree with Keith that the UK needs a comprehensive alcohol strategy and that this is probably easier to sell when consumption is rising, but the scale of the problem demands this anyway. 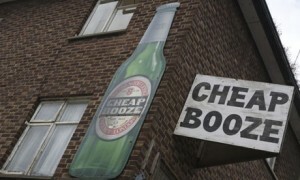 Any strategy that permits ready availability of astonishingly cheap alcohol will be battling uphill to achieve its aims. Simon, I think you err in implying that rational choice models are falsified by the observation that income and drinking are negatively correlated, for several reasons. First, a positive correlation between income and consumption isn't actually a prediction of rational choice models: an increase in income could increase or decrease consumption of any good, according to the canonical model. Second, the model makes predictions over how a given person's behavior will change if their income is changed, but the correlation between income and alcohol consumption to which you refer is calculated over many individuals. Other personal and contextual variables, then, vary with income when we calculate that correlation, and it could then be the case that any and every individual increases her drinking when income increases and at the same time the correlation between income and drinking is negative. Finally, standard random utility models predict that a given covariate will generally affect the intensive (how much to drink) and extensive (whether to drink) margins differentially, so I'm not sure why you consider this result evidence against a rational choice framework. These sorts of models form the basis of the large literature in applied microeconometrics on demand for alcohol. I think the point you bring up about what economists would call substitution—increase the price of alcohol, and people will substitute something else to go “off their heads''—is a good one and often overlooked in the literature. A number of studies, however, do include prices of multiple drugs, or explicitly attempt to model joint consumption behavior, for example, explain both smoking and drinking patterns using data on both tobacco and alcohol prices. The social consequences can then be evaluated in terms of how overall consumption patterns change when alcohol prices change instead of just in terms of how alcohol consumption changes. One example of this sort of strategy is Dinardo and Lemieux, J Health Econ, 2001, who examine how changes in minimum drinking ages affect kids' alcohol and marijuana consumption. They find that increasing the minimum drinking age decreases alcohol consumption and increases marijuana consumption, because when kids find it more difficult to get alcohol, they smoke more pot. The net social effect then depends on the relative social damage caused by these two substances (incidentally, -every- economic model depends on -relative- prices). Yes, a delightful exachange indeed! Not all price elasticity studies are based on population level data. Murphy and MacKillop (2006) have done some excellent work specifying individual demand function for alcohol among young adult drinkers in the US…exacly the group we should be most concerned about by my estimation. Their work supports the notion that removing inexpensive sources of alcohol could very well reduce overconsumption. Also, Petra et al. (2009) have shown that heavy drinking young adults in the UK actually have higher own elasticities of demand than moderate drinkers. This is mainly because they more readily engage in switching behavour (switching to whatever product provides the cheapest source of alcohol). This suggests that to be effective minimum pricing needs to set a price floor across all available products. This could be a problem in some Canadian jurisdictions, for example, because we have U-brew and U-vin shops that supply wine and beer very cheaply. And we should indeed thank Saskatchewan for their recent policy changes…they may have just given us what we need to empirically verify whether or not minimum price policies target heavy and problematic drinking. I love natural experiments! Finally, it is indeed the case that disposible income can have strong effects on overall demand (positive and negative). We have been calling for indexing alcohol prices to inflation to keep them from becoming cheaper relative to other goods over time. Seems to me there is no reason we could also adjust alcohol prices for changes in disposible income to help control consumption and harms. How's that for using economic theory to your advantage! Petra, S., Purshouse, R. & Brennan, A. (2009). Policy options for alcohol price regulation: The importance of modelling population heterogeneity. Addiction, 105(3):383-393. Murphy, J. & MacKillop, K. (2006). Relative reinforcing efficacy of alcohol among college student drinkers. Experimental & clinical psychopharmacology, 14(2):219-227. Interesting. When asked to appraise the likely effects of minimum pricing, we did not opt to look at only a narrow band of health outcomes, but consider explicitly crime and workplace outcomes as well (no reported in the Lancet paper you may be aware of, as this has a clear health focus, but check out the report "Independent review of alcohol pricing… Part B. Modelling" available on the DH website). You will also find that income is controlled for when estimating elasticities, and that the modelling is, for the most part, not based on aggregate data. I was interested in the statement that lower income/SES groups drink more heavily – all the evidence I have seen from the UK seems to show the exact opposite in terms of overall volume with, unlike in other countries, no clear gradient in harmful drinking patterns. In terms of drugs being a complement or a substitute to alcohol: There is conflicting evidence out there. My theory is that it depends on the time-scales you consider. In the short term, it is quite plausible that kids drinking now would seek to substitute. In the longer run, it seems to work the other way around: It seems that if young people are less likely to start drinking early and consume less alcohol, they are also less likely to start engaging in drug use. We know from longitudinal studies that very few non- or light drinkers start taking drugs, so in the long run, stopping very cheap alcohol being widely available may have the "side-effect" of reducing initiation to drug use. Interested to hear other people's ideas. Petra (Meier) – the socio-economic status drinking behaviour I mentioned comes from the Smoking, Drinking & Drug Use survey and covers 11-15 year olds. Free school meals (FSM) as measure of socio-economic status and using a hurdle model we find that receiving FSM is positively associated with number of units consumed in a week, but negatively associated with drinking alcohol. I should have been more specific. Gerald, I like MacKillop's papers in this area, and yes they does suggest that as price increases demand falls. However, it is a lab based study. In the real world, in the UK, there are drinkers who remain abstinent for a couple of weeks, saving their money, and then have one big binge. But I still stand by my opinion that what we really need is a good panel survey that includes school age kids and a host of criminal and consumption measures. And one that does not under-sample the most vulnerable. In terms of the gateway effects of alcohol – I am not so sure. I would imagine that drinking takes kids to times and places where they are exposed to alternatives, rather than substitution occurring due to the consumption of alcohol. Taking alcohol away (though restricting availability or through price) might mean they can socialise in more legitimate ways, so reducing exposure to potential substitutes. I would imagine that sensation seeking youngsters will always find something to do, legitimate or illegitimate, better the former and even better if it is pro-social. Raising the price of alcohol will not convert rambunctious youths to angels overnight. Wagenaar, Salois, and Komro. 2009. Effects of beverage alcohol price and tax levels on drinking: a meta-analysis of 1003 estimates from 112 studies. Addiction 104, 179–190. Chaloupka, Grossman, and Saffer. 1998. The Effects of Price on the Consequences of Alcohol Use and Abuse. Recent Developments in Alcoholism. 14(3), 331-346. There has been lots of work in the last decade, though, as more and more panel microdata become available, but I don't know of a more recent survey. It is true that there isn't yet a lot of work on younger adolescents using panels, as there aren't yet many panels covering, say, 11 to 13 year olds (a commonly used dataset is the NLSY79, for example, in which the youngest respondents in the first wave were 14).